Global Justice Ecology Project (GJEP) is proud to present the following three documentaries for you to view and share. 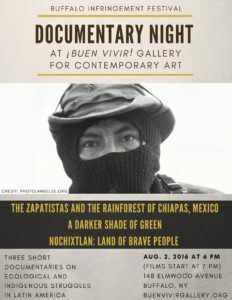 GJEP‘s Executive Director, Anne Petermann and Orin Langelle (Gallery Director) worked on two of the three films listed below which were shown at the ¡Buen Vivir! Gallery for Contemporary Art on Tuesday, Aug. 2 as part of the Buffalo Infringement Festival. While it has become quite trendy among politicians in the US to denounce global trade deals, especially NAFTA (the North American Free Trade Agreement), this first film from 1996 documents the origins of the fight against NAFTA in the jungles of Chiapas, Mexico. While 20 years old, the issues in this film are just as relevant today. Today, as social movements around the world continue to resist unjust “free” trade agreements such as the TPP (TransPacific Partnership), the Zapatistas continue to be an inspiration. This film critically examines government and UN schemes to use forests in Mexico and Brazil to “offset” greenhouse gas emissions in the US and the impacts these schemes would have on communities in all three countries. It was filmed in 2011 in the village of Amador Hernandez in the Lacandon Jungle of Chiapas, Mexico; as well as Acre, Brazil and Richmond California. It is a film about the power of resistance by local communities and Indigenous Peoples against unjust false solutions to climate change. This film documents ten years of resistance by teachers in Oaxaca against repressive policies put in place by the government to break the power of the teacher’s union and pave the way for privatization initiatives.